Although the stories here are fiction, they could have all happened at some point or another. They highlight the horrors and effects of war on the people closest to it. In the nineteen extraordinary stories that comprise The Devil Is a Black Dog and Other Stories, writer and photojournalist Sándor Jászberényi shows us the human side of war and revolution in the contemporary Middle East and Africa, and of the social upheaval that has held Eastern Europe in its grip since the fall of communism. Characters contemplate the meaning of home, love, despair, family, and friendship against the backdrop of brutality. From Cairo to the Gaza Strip, from Benghazi to Budapest, religious men have their faith challenged, and people under the duress of war or traumatic personal memories deal with the feelings that emerge. Often they seem to suppress these feelings ... but, no, not quite. Set in countries the author has reported from or lived in, these stories are all told from different perspectives, but always with the individual at the center: the mother, the soldier, the martyr, the religious man, the journalist, and so on. They form a kaleidoscope of miniworlds, of moments, of decisions that together put a face, an emotion, a thought behind humans who confront war and conflict. Although they are fiction, they could have all happened exactly as they are told. Each story leaves a powerful visual image, an unforgettable image you conjure up again and again. Sándor Jászberényi (Shahn-dor Yahs-ber-ay-ñee) is the author of The Most Beautiful Night of the Soul: More Stories from the Middle East and Beyond (New Europe Books, December 2018). In 2017 he received Hungary’s Libri Literary Prize. 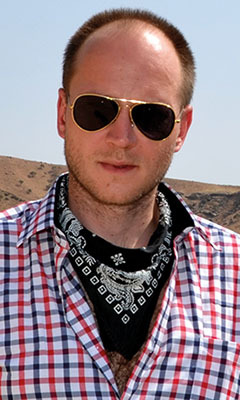 As a correspondent for Hungarian news sites, he has covered the conflict with Islamic State, unrest in Ukraine, the revolutions in Egypt and Libya, and the Gaza War. His writing has appeared in the Wall Street Journal, the New York Times Magazine, AGNI, and the Brooklyn Rail. He divides his time between Budapest and Cairo.